When Darren gave me this paper collection from Kaisercraft I had the perfect pictures in mind for a lovely layout with a french feel. A few years ago Harry and I went to Paris and of course Disneyland. After dropping our bags at the hotel, the first thing I took him to see was the Eiffel Tower. I'll never forget his face as we walked around the corner to see it looming above us. He'll never forget it either nor the huge Strawberry ice-cream he had standing underneath it. The pink papers in this collection have a sort of strawberry feel to them too. We had a few days sight seeing in Paris, including a whistle stop visit to the Louvre. All he wanted to see in there was the Mona Lisa. Once he'd seen that she does appear to watch you as you move around the room he was ready to go lol!!! When we arrived at Disneyland, the first thing on Harrys to do list was have his picture taken with Mini Mouse. We waited an hour and a half for this snap, another real treasure of a picture. 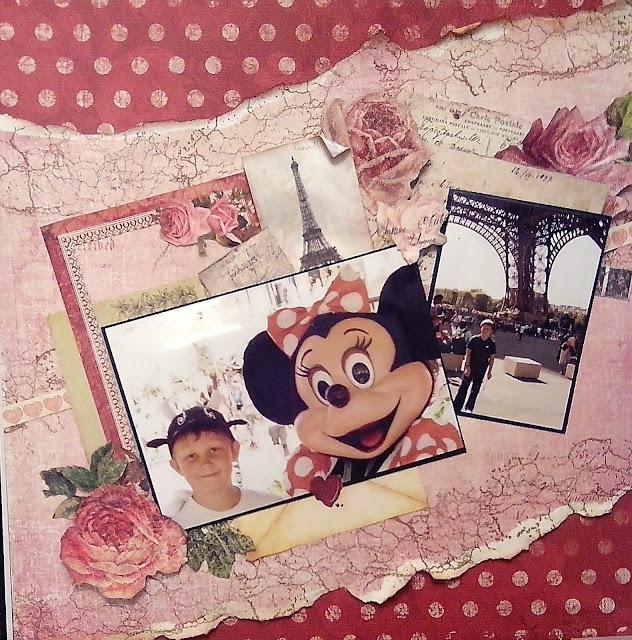 So I thought I'd put both pictures together in this layout as a keepsake of our trip for him. We did have Minnie's autograph, which would have been a lovely addition but sadly I couldn't lay my hands on it. The papers used are all from the Key to My Heart collection by Kaisercraft, stocked and supplied to retailers by Jones & Co. Heres the link to their FB page too. Morning Clare, This layout is gorgeous, fabulous papers and beautiful photos, a fabulous keepsake. Good evening Clare, I'm a little late in catching up with your blog today due to even more Christmas shopping, but I'm here now and just love the fabulous layout you've shared with us. I totally agree with Patricia, the papers are so pretty. Methinks I may have to investigate this collection. Enjoy the rest of your day. I just wanted to let you know I am running in circles looking like a fool because you have a blog!!!! I was on a never ending search for basis for mini album and how to assemble/put together/whatever you want to call it. I didn't want the same old style everyone was doing, but I was also tearing through paper trying to devise something I was happy with. Plus I am rather short on time..so off to You Tube I went....I would get about 2-3 minutes into a video and look for another one...Until I came across your 12 days of Christmas!!! I could not stop watching what you are creating!!! Love your style, choice of paper...ok everything you do!!! So I had to see if you have a blog and you do!!! Needless to say I will be coming back to do some serious browsing after holidays are over with. But a HUGE thank you for how I want to do this mini..I just couldn't decide!